This wonderful set of Snowmaiden with the Winter Bunny and Christmas Tree Nesting Dolls, consisting of 5 items, depicts Snowmaiden with the Winter Bunny and Christmas Tree. The Babushka dolls were painted in accordance with Russian tradition of Matryoshka painting. The set consists of five dolls that depict Snowmaiden, popular hero of Russian fairies. There are pretty a lot of stories about Snowmaiden’s origin and life. According to one, Snowmaiden is a granddaughter of Father Frost. Every winter she and her grandfather receive letters from kids, in which kids ask Father Frost to bring them special presents for the Happy New Year. On the 31st of December Snowmaiden and Father Frost leave their forest and go to children’ houses to give them presents. If you take a look at the Russian Matryoshka Nesting Dolls, you’ll see that next to every Snowmaiden decorated Christmas tree is painted. The artist has masterfully featured every detail of it; here you can notice red and yellow baubles, snow-white beads and even separate needles of Christmas tree. Christmas tree, as well as Snowmaiden, is the most important element of every New Year. On the first three Russian Matryoshka Nesting Dolls Snowmaiden is depicted together with the Winter Bunny, the squirrel and the robin bird. All these animals could be found in Russian forests, where Snowmaiden and Father Frost live. What astonishes the viewer, when he/she looks at these Babushka Dolls is how masterfully the artist has drawn Snowmaiden. Her skyblue eyes express kindness and love. Each Matryoshka Doll is performed in cold palette – their coats are blue and their kerchiefs are of “frozen rose” color. The artist combines both quash and watercolor to reach an effect of delicacy and richness. Matryoshkas’ clothes feature traditional Russian girls’ clothing – kerchief with floral prints, richly ornamented coat with fur decoration. The Russian Matryoshka Nesting Dolls were designed and hand-painted by famous Russian artist exclusively for Russian Treasure store’s customers. This set of Snowmaiden with the Winter Bunny and Christmas Tree would make a great and gorgeous Christmas and Happy New Year gift. 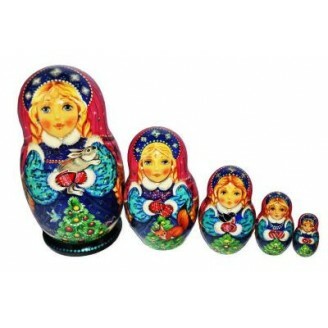 The Russian Nesting Dolls can be a great decoration for any home or office. They will bring an air of love and peace to you. While looking at these Russian Matryoshka Nesting Dolls every person goes back to those times when he/she was a little kid and dreamt about miracles. Let a miracle come to your house or to the house of your beloved person!